Doyle R. Thorne was born April 29, 1942, in Brigham City, Doyle served as a helicopter pilot in Vietnam in the United States Marine Corp., and held the rank of Captain. 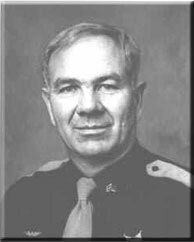 Doyle joined the Utah Highway Patrol on July 16, 1975. In December 1988, Sergeant Thorne transferred to the Aero Bureau to fly the Department of Public Safety helicopter. Doyle flew many rescue missions during the next 5 years. On July 30, 1994, Sergeant Thorne was flying a search and rescue mission for a missing 2 year old girl in Duchesne County. Once the small girl was located, Sergeant Thorne began to return to Salt Lake City. He soon radioed a "may day" and disappeared from radar. Three days later, his craft was located. Sergeant Thorne had been killed instantly. He had lost his life while serving others. Doyle was survived by his wife, Luci, two daughters and two sons.